I love reading blogs. I love how 'in the loop' they make me feel even though I'm far from the heart of publishing. I love how much I learn about the industry and about the craft of writing. Take Kidlit.com for example. Today's discussion is fascinating; "When to Tell Instead of Show". Now I'm sure that like me, you've all heard the practically sacrosanct phrase Show Don't Tell. And yet, if you look at any great piece of writing, you'll see times when the author does employ the direct technique of telling. 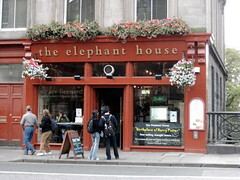 In this Kitlit.com post, which I highly recommend you read, agent Mary Kole goes through a couple of examples of 'author telling' from one of the Harry Potter books (the cafe pictured above is where Rowling wrote). What it comes down to, is that a writer must know when to tell and when to show. Of course, the trick is in making the writing seamless so that the reader is so engrossed in the story that they really don't notice what technique is employed. That, is the mark of really good writing; the ability to draw the reader into the story. That's what we all try for. That's what J.K. Rowling achieved.